The commercial space company, led by billionaire Elon Musk, held out hope of launching the first Falcon Heavy test flight before the end of December until recently. The delay to early 2018 was first reported Tuesday by Aviation Week and Space Technology, and SpaceX confirmed the schedule slip to Spaceflight Now. 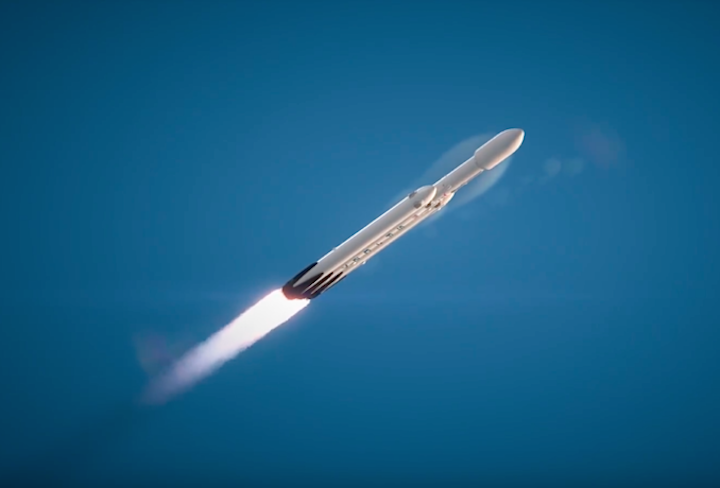 Gwynne Shotwell, SpaceX’s president and chief operating officer, told Aviation Week that the launch will follow the Falcon Heavy’s static fire, which is set to occur in December, by a few weeks. SpaceX is poised to move launches of its single-core Falcon 9 rockets to pad 40 at neighboring Cape Canaveral Air Force Station, beginning with a Dec. 8 flight to send cargo to the International Space Station, freeing up pad 39A for final upgrades and outfitting to support the Falcon Heavy. Workers at pad 39A this week are reconfiguring the base of SpaceX’s mobile strongback transporter and erector tower for the Falcon Heavy, which is made of three modified Falcon 9 first stage boosters arranged in a side-by-side configuration. Cranes and work platforms were visible near the base of the strongback structure in the last few days. The tower was laying horizontal at pad 39A after SpaceX removed a Falcon 9 rocket from the strongback following an indefinite postponement of a launch that was planned for mid-November with the U.S. government’s top secret Zuma payload. Once the Falcon Heavy’s triple-body core and second stage are assembled inside SpaceX’s hangar, the transporter will roll into the integration building and cranes will hoist the rocket onto the strongback. The rocket will roll out to pad 39A for a fueling demonstration and at least one static fire test — depending on the test’s outcome and results — before SpaceX gives the “go” for a launch attempt. The static fire will mark the first time SpaceX has fired 27 Merlin 1D engines at once. A test stand big enough to support such a hold-down firing does not exist at the company’s rocket test complex in McGregor, Texas, where each of the three booster cores has been fired individually. Musk has tried to set expectations low for the Falcon Heavy’s maiden flight. “Falcon Heavy requires the simultaneous ignition of 27 orbit-class engines,” Musk said in July. “There’s a lot that can go wrong there. The 27 Merlin 1D engines will generate more than 5.1 million pounds of thrust at full power, about two-thirds the thrust produced by the space shuttle at liftoff, and more than any other present-day rocket. “This is one of those things that’s really difficult to test on the ground,” Musk said. “We can fire the engines on the ground, and we can try to simulate the dynamics of having 27 instead of nine booster engines, and the airflow as it goes through transonic (as it exceeds the speed of sound). It’s going to see heavy transonic buffet. How does it behave at Max-Q (maximum dynamic pressure)? A single Merlin engine on the Falcon Heavy’s second stage will finish the climb into orbit. SpaceX has not announced the specific orbital destination for the Falcon Heavy test flight, but the demo mission will not carry a customer payload. First announced in 2011 with a target launch date in 2013, the Falcon Heavy’s development took much longer than Musk originally predicted. The side boosters on the inaugural Falcon Heavy flight are refitted Falcon 9 first stages recovered on previous SpaceX launches. Ground crews added aerodynamic nose cones to the boosters and installed forward and aft attach points to connect to the newly-manufactured center stage, which sports structural enhancements to accommodate the extra stress of a Falcon Heavy launch. After completing their firings, the side boosters will shut down and jettison from the core stage, flip around and thrust back toward landing pads at Cape Canaveral, descending back to Florida’s Space Coast in formation for nearly simultaneous touchdowns. The center stage will throttle up and burn its nine engines longer, heading for landing on SpaceX’s offshore recovery platform in the Atlantic Ocean while the second stage fires into orbit. The availability of pad 40 for SpaceX’s upcoming Falcon 9 launches clears the way for crews at pad 39A to focus on the Falcon Heavy. A rocket explosion damaged pad 40 last year, forcing SpaceX to base its Florida launch operations at KSC’s former space shuttle pad until repairs were completed. Falcon Heavy launches and Falcon 9 flights carrying astronauts for NASA will take off from pad 39A, while pad 40 will host most commercial missions. But having both pads gives SpaceX officials flexibility in launch planning. SpaceX has accomplished 16 Falcon 9 flights so far this year — 12 from the Kennedy Space Center and four from Vandenberg Air Force Base in California. At least two more Falcon 9s on SpaceX’s launch schedule this year, one set for blastoff from Florida and another from California. A Dragon supply ship is scheduled to take off from pad 40 at Cape Canaveral no earlier than Dec. 8 with approximately 4,800 pounds (2,200 kilograms) of experiments, provisions and spare parts for the space station and its six-person crew. Another Falcon 9 launch is on track for Dec. 22 from Vandenberg Air Force Base with 10 Iridium voice and data relay satellites. SpaceX’s first confirmed Falcon 9 mission in 2018 is slated to loft the SES 16/GovSat geostationary communications satellite for SES and the government of Luxembourg. That launch is scheduled for no earlier than Jan. 15, according to a regulatory filing with the Federal Communications Commission. A launch date for the mysterious Zuma mission has not been set after its postponement from mid-November to study a potential issue with the Falcon 9’s payload fairing, the shroud that covers satellites during the first few minutes of flight.